Architects can help people think outside the box to solve their problems, challenges & needs. The importance of the architect has been forgotten: The architect should actually be appointed before any project is attempted in order to help advise & consult client in decision making process & to suggest possible ideas. More than often, the most workable solution requires a paradigm shift (outside the norm), from the client and/or the end user. If the client or end user cannot accept such an ‘alternative’ idea as the ideal solution, a lesser appropriate solution would need to be found. It is up to the architect to convince the client & end user to accept such a paradigm shift, but it is also up to the client or end user to be open to alternative ideas, which could possibly be much more appropriate. The end user should not be underestimated: Most people in SA these days have access to the internet & cable television. Some people might be uneducated or even illiterate, but they are not necessarily uninformed. Through the many programs on television & information found on the internet, people are suddenly exposed to a global city with a global way of thinking, building and doing things. Basic needs of any human is shelter. To fulfil the basic need of humans, the concept of the word ‘shelter’ must be considered: Shelter is much more than a roof over your head. It is also a place for belonging, a place to return home to every day, a community, a safe haven, a place to store their belongings………’shelter’ can even be a history of a person or a group or a culture. A shelter does not have to be elaborate, grand, large, vast or decorative, but it needs to fulfil one’s basic needs at the very least. A shelter must always be meaningful, appropriate, fulfilling, uplifting, contributing to the need & challenge solving. The San people knew how to live close to the earth, of the earth and to protect of the earth. They were a nomadic people who only ‘took’ what was needed from the earth, and moved elsewhere when the Fauna & Flora started to thin out because of their presence. When the animals, roots etc. started thinning out, they migrated elsewhere. When arriving at a new thriving and recovered location they would plant a stick in the ground to mark ‘home’. They did not need to build anything to create a home, but merely plant a stick. The stick gave them the sense of belonging, the place they called ‘home’. Shelter was a cave where possible, or a movable half-domed hut made of natural elements. They were totally self-sufficient & self-sustainable. Everyone needs to fulfil their basic need for water, fire, shelter, and a toilet……. thus basic services. But services are not necessarily what we think it is and does not necessarily have to be provided in bulk and is not the same for everyone. One’s dependency of service providers can be relieved by providing a self-sufficient solution for everyone. Basic shelter is a roof over one’s head, clean (potable) water, maybe electricity and a toilet…..not necessarily a brick building, piped water & cabled electricity or a flushing toilet. Shelter can also just be a canopy to protect you from the sun and the rain, a borehole or catching (harvesting) rainwater, sun (solar) panels to provide hot water or electricity, and a compost toilet which can also provide compost for a vegetable garden, which in turn provides vitamins through food. In fact, the canopy can be the solar panels. Self-sustainable elements could work independently of the service provider and make the user independent of services for a lifetime, thus self-sufficient. We can still be self-sufficient and sustainable in our day and age …………… but not for long! If we do not all work together, and if those who are charged to set an example do not act immediately (by initiating self-sufficient buildings and projects), then it might be too late to stop the downward spiral towards self destruction. Peter Stutchbury, a renowned and multiple laureate Australian architect, reminded me of what shelter & appropriate settlement actually is through the following analogy: He used the example of camping. When you arrive at a place where would you would like to camp, would you consider pitching your tent (shelter) in the sun or under a tree? Would you consider where the sun rises & sets in order to have the tent in the shade for as long as possible? Would you consider where the water would come from during an unexpected or sudden downpour, in order to prevent the water from flooding through the tent? If you do all these things when camping for a relatively short period of time, why would you not consider these things when building a permanent structure? 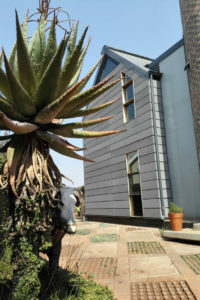 There is a move towards modular & pre-manufactured architecture in South Africa again. I say again, as it was mainstream during the late 1800’s, with Victorian pre-manufactured buildings, as well as after the 2nd World War there was a massive shortage of housing. Victorian buildings could be ordered from a catalogue and shipped anywhere in the world. The massive destruction of buildings & infrastructure through bombings during the 2nd World War, resulted in a massive shortage of housing (very much the same problem we and other countries currently have). The people working in factories, (mostly woman as the men were on the Front Lines), who manufactured tanks, planes, etc., were optimised to manufacture quick & effective housing units, (pre-manufactured & Modular), for all those who were left homeless when returning from the front lines. This ‘trend’ continued through the 50s & 60s, which if you look carefully, you will see many examples here in South Africa. Unfortunately there were also very poorly manufactured examples of these, and together with the misnomer that prefab is cheap and nasty, the pre-manufacturing business withered a bit during the 80s & 90s. Disused shipping containers actually revived the pre-manufacturing of buildings again, and even became trendy at a stage. Containers are ‘upcycled’ after being scrapped for its intended use, and then reused for site offices, storage & ‘spaza’ shops. Later it became fashionable to use containers for housing units, offices, shops and even hotels and Backpackers. Containers are not ideal though: They are too narrow for most used, uninsulated, and if you cut a hole in it, you have to strengthen it again……..and they started to even become scarce & expensive. Pre-manufactured Modular systems are also manufactured in a factory, but are more complete when they arrive on site. They are manufactured from various materials like steel, LGS, timber….even cardboard, or a combination of these and more materials. 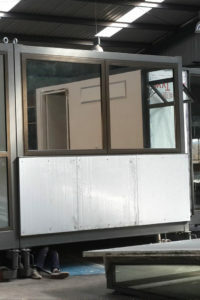 The biggest advantage of a modular system is that almost everything is constructed in a controlled environment of a factory, very little needs to be done on site, accept for placing the modules next to and on top of each other and connect them to each and the site services if any are available. ‘Foreign’ ideas does not need to be foreign anymore. Thus it might now be the time to try new ideas and concepts to see if those aren’t the direction to move in. If new ways of thinking is not accepted or tried out, we are just losing time, because, sooner or later those ideas will become more familiar or ‘main-stream’ and then be accepted anyway; SO why not do it sooner rather than later. In order for everyone to gain from what is possible now, why not accept the advances already made? The building industry cannot afford NOT to use architects from the outset on every project! The authorities, should be paving the way for the citizens of the country, by setting an example for the rest of the parties involved in the building industry and for the public at large. The authorities should be the pioneers in the building industry……. and can be together with the very competent & creative architects of this country. The public can also urge the authorities to adjust the legislation where needed, to make it possible to utilise all the option at hand to us. The architects of SA have the knowledge, know-how, expertise, creativity, passion & eagerness to assist in paving the way forward. Architects should be used, treasured & appropriately compensated, in order to keep on existing as a ‘species’, because without them meaningful building projects are much less likely, if not impossible. The architect’s role is also to inform: As the architect’s business is to research, implement & utilise new ideas, concepts, building methods, materials, etc., and thus exposed to these things on a daily basis. He is also the ideal person to consult, initiate, bring together and execute new projects. 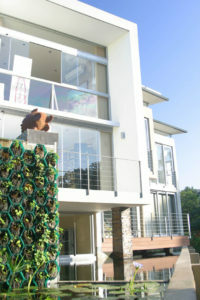 The architect is the only person involved with a project from the initiation to the completed built project. The Architect is the link between the client or user and the professional and the contractors. The Architect can speak everyone’s language, whether it may be the client, to determine their needs, the professional team, to amalgamate, interact & consolidate the different designs & services, or the Contractors, to interpret, translate & execute the works.